Thank you for your purchase of a Zoeller product. We hope it provides you with many years of service. Registering your product will allow us to contact you in the event a safety notification is ever needed. Registration will also help confirm ownership if you ever need assistance with your product or in the event of a warranty issue. Zoeller Company values your privacy and will never share your information with other companies. Enter Product ID or Serial Number. 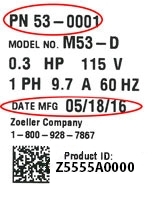 The Product ID label is found on the pump housing or attached to the power cord. Manually enter the required product information. Enter the Date Mfg as MMYY. For example if the DATE MFG is 11/11/15 enter 1115. 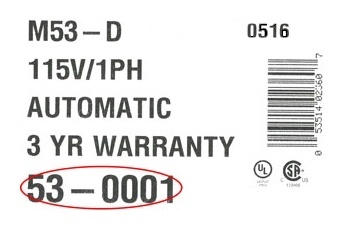 The 4 Digit Date Code (MMYY) is found on top of the pump or on the outside of the carton. Example: 0516 is May 2016. 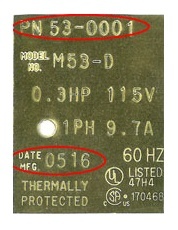 The Part Number (PN) is found on the outside of the carton.